Recurring, Continuing, Frequently Scheduled Dance Party Events go here. PLEASE put Special, One Time or Infrequently Scheduled Events and Classes or Work Shops on one of the DanceNet's Other Calendars which have their own ON LINE Input Forms. This is a Free, SELF SERVICE Calendar. Announcements WILL BE edited for excessive space, non dance content and if the text lacks DANCE PARTY data, etc. The submission form information is automatically posted to this page. It is not edited or verified in any way on submission. Likely Best to check all the details as arrangements do change without notification. The descriptions and details are those of the submitting party. This is a Free, Self-Service Calendar, so to make changes immediately, YOU are expected to re-submit your Event on the Self-Service Submission Form and then request the old post be deleted.. Those that fail to notify the Regular Events Editor to delete old notices risk having the next old/duplicate item editing session. All information must be updated within a year from the date submitted. as all events are deleted after 12 months. FREE food, beverages and free parking! Great dance floor and wonderful ambiance. Come and meet new friends who loves to dance like you! About Debbie: The multi awarded dance instructor awardee for years. * Mention meet up at the registration desk to get your discounts. Have fun! Join us every Monday Night for a Salsa Dance Class beginning at 7:45pm and a Latin Dance Party at 8:30pm. First time class is only $10! Instructor Nathaniel Bond will be there for any questions or suggestions needed. All Ballroom and Latin music will be played to get you in the best mood and have the most fun practicing. Free Ballroom Dancing & Lessons (waltz, rumba, tango & more). A Friendly group, like family: dancing for enjoyment. Every Monday at 7:30. However, there will be no dancing on 3 Mondays in November: Nov 2, 9, & 16. We dance in the Community House, 17801 Meetinghouse Rd, Sandy Spring, MD 20860. Sandy Spring is on rt 108, 14 miles west of the north end of RT 29. It’s an old building with a fine wooden floor. No partner needed - we encourage changing partners; variety is very instructive. Dress comfortably. Everyone is welcome! and there are all sorts of dancers. This is our 19th year and it is always free!! Every Tuesday Standard Seminars and Rounds, ideal for intermediate to championship level. Classes are $20 each. 10-lesson class card is $180. Arthur Murray Dance Center Silver Spring offers beginner Ballroom and Swing on Tuesday Nights at 7:00pm $10 per person per class. There is also a practice party following the class at 7:45pm. Practice your steps and meet some new people. on Woodmont and on Cheltemham across from Midas Muffler. Come with a partner or fly solo, everyone is welcome! Join us every Wednesday and Friday evenings to practice your dancing to a combination of strict tempo ballroom music, golden oldies, latin, tango and current Top 40 hits. 8421 Arlington Blvd in Fairfax VA. The ELKS Lodge has a large open space with plenty of room for dancing and offers food and drink services. rotating list of DJs play beach music, R & B and current songs that are perfect for shagging. Dancing is normally from 6:30-7:30 pm and from 8:15- 10:30 pm. The Hollywood Ballroom is OPEN and under NEW MANAGEMENT! Just outside the Beltway off Route 29, Colesville Road"
7,200 square-foot floating maple wood dance floor. 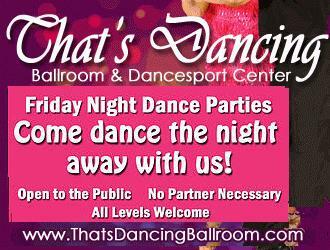 From 8:15 PM to 11:30 PM every Wednesday night, social ballroom. ingles and couples, young and old playing a few mixers and line dances, too. Some dances are preceded by a complimentary dance lesson from 7:45 to 8:15 PM, free with admission to the dance. Social dancing 4 nights a week: Fridays, Saturdays, Sundays, and Wednesdays. 9:00pm-Close Dj Gringuito "The World's #1 Bachata DJ"
Spinning Classic Bachata, Sensual Bachata, Old School Bachata, Urban Bachata, Italian Bachata & Much More! Turn right from the escalator exit to Moore Street, then left onto Wilson Blvd. Admission: $15 general admission, $10 for Tango students. This hall features a cushioned dance floor and plenty of room - a perfect atmosphere for the dance of Argentine Tango. Dance 9 pm - Midnight with Teacher and DJ Fabio Bonini, playing Traditional Tango, Milongas, Waltz and Tango Nuevo. Food and drinks provided, welcome to bring anything to share. Join Dance Bethesda with Michael and Gizelle every Thursday night from 7pm - 9pm for a fun night of social dancing for all levels. Learn how to dance with a partner to some of the major social dances commonly danced at weddings, cruises, and other social events such as the Waltz, Foxtrot, and Swing. Gain the skills to be comfortable on the dance floor at your next formal or casual event. Singles and couples welcome. Partners will be switched frequently during each class. Please note class cards are not valid for Social Thursdays. The Studio sign is not installed, we are on the first floor of the Quality Window & Door Building. Can't stop your body from moving when you hear those songs come on? Have you been dying for a night that would play the hottest Bachata songs and stay true to it? Well Bachata-holics we're your dealers and we're here to give you your Bachata Fix! EACH and EVERY THURSDAY thereafter!......BACHATA MANIA THURSDAYS runs at El Pike Restaurant & Lounge!! A HOT night of BACHATA MANIA - Plain and simple!! 10:00pm - BACHATA MANIA Party begins! Get your MANIC Pass, come five nights - get your 6th night free!! 8:00 to 9:15PM Joe Petrisko teaches milonguero style tango for all levels. 11:00 traditional, nuevo & alternative rhythms until close. Capital Blues hosts the popular Slow Blues and Swing Dance in the Back Room at Glen Echo Park (almost) every Thursday from 9 – 11:30 pm, with a 45-minute beginner lesson at 8:15 pm. DJ Mike Marcotte & Guests play a variety of styles including traditional and contemporary blues music, and classic cover tunes going back through the history of blues music. There will also be a smattering of swing tunes of various tempos to suit all dancers. Admission is $8. No partner required. Join us for Salsa, Bachata, and Kizomba dancing every 2nd and 4th Thursday. Enjoy Vini Culture's beautiful atmosphere, and please come early for drinks and delicious food! at the Sport and Health Club - Lakeforest, Gaithersburg. Price: $12-15. $10 for dance only. Lesson 7-8 PM, followed by Dance Social 8-9:30 pm featuring Swing, Rumba, Tango, Waltz, Fox Trot, Cha Cha, Mambo, Samba, Salsa, Disco, Bolero and Ballroom Line Dancing (no partner needed). Beginners friendly & Friendly crowd. Singles, couples and all levels welcome. Drop-in $20/pp OR save 50% for both you & a first-timer guest! 9:00-11:30 the lights are turned down to Party with popular Latin and Ballroom music, refreshments, club style lighting, candlelit tables beside the main dance floor and in the lounge. Customary dress is “smart casual” or better. Every week Dancemasters Ballroom features a Beginner Friendly lesson starting at 7:30pm followed by open dancing until 10pm. Two American Style Ballroom Beginner Classes with Sergey & Olga! 9:00pm - Midnight Social Party! 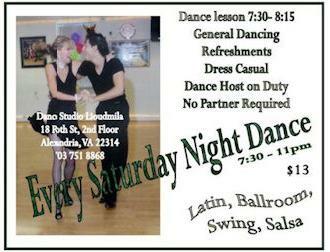 This Every Friday night ballroom lesson/party is hosted by Eva and Richard. Located at Crown Dance Studio, 2820 Dorr Ave, Fairfax, VA 22031. Dimitar Petrov is the instructor to teach Latin and Standard dances. 7:30-8:15pm Latin dance; 8:15-9:00pm Standard dance--Change every month- Cha-Cha and Tango for month of August, 2015; 8-12: General Dancing. Cost: lessons+party:$15; Party only:$10; Late night special (10:30-12):$5. We provide the best dance music; very friendly environment and good refreshments to serve the dancing community for all the dancers having a wonderful evening. specializes in International standard and Latin. Dimitar has been well known in teaching, competing, performing for many years at Metro DC area. In recent years he has been practicing with and coached by world class dancer Anna Mikhed. when seated in the Single Dancer Section and Mix Ladies!! 2605 Lord Baltimore Drive Baltimore, MD GPS (Windsor Mill)) 21244.
eekly Fri Dance-&-Learn Practice Parties & Socials, to include beginner & int level mini-dance classes (2 levels at once with 2 teachers) plus teacher-assisted practice time for all levels in any of the Ballroom (Waltz, Foxtrot, Tango, Quickstep, Viennese Waltz) & Latin (Rumba ChaCha, Samba, Paso Doble) dances plus Salsa, Tango, all types of Swing (East Coast, West Coast, Lindy Hop & Jive), C/W 2-Step, line dance & more by request. Snacks & refreshments included. There'll be 3 mini-classes of 1/2 hour in 1) Ballroom, 2) Latin & 5) Swing. You name the dance style by majority present, and with a little time and effort, eventually you'll be DANCING ALL of them!! Take the workshop(s) by request or just come to socialize and practice with teacher assistance what you already know. We are fortunate to have a HUGE space with a LOT of mirrors on MANY wheels so there's plenty of room & possibilities to dance it all; right here in the heart of DuPont Circle, DC, walking distance from Metro and LOADED with FREE adjacent Embassy Row evening and weekend parking. If you or someone has a birthday, all BIRTHDAYS during their present month get one class or dance party FREE! $15 ALL Night with FREE food, drinks & Free Parking! 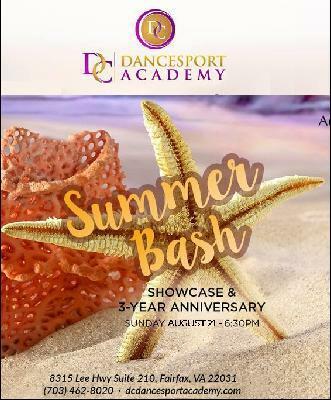 Experience the beautiful ambiance of the studio, gentle camaraderie of fellow students, and the great wooden floating dance floor, great surround sound system and learning from the TOP Instructors around the area! Special Discounts for Students! Metro Accessible! Call 301-661-5809 for more info. Or visit www.dance911.com. Special Dance Packages Available. Drop Ins always welcome. NO PARTNER required. Memberships available. email mitzi@dance911.com for more clarifications. We feature a 7,200 square-foot floating maple wood dance floor -- one of the LARGEST in the entire DC/Baltimore area. From 9 PM to 12:30 AM every Friday night, Hollywood Ballroom in Silver Spring hosts a social ballroom dance. We are just outside the Beltway on Route 29, Colesville Road. Singles and couples, young and old always have a great time! We play a few mixers and line dances, too. Every dance is preceded by a complimentary dance lesson from 8 to 9 PM, free with your paid admission to the dance. We're air conditioned and non-smoking, food and drinks are available, and our parking is free, safe, and abundant. Friday Night: Just the right combination of practice and fun! Start your weekend early at our Friday Night Practice Party! Chris and Lee are on hand to assist you as you practice what you've learned that week! 8:00 til 10:00pm. Light refreshments are served. $10 No reservations required (yet!). Dance lesson 1:00pm to 1:15pm. Singles, couples, all levels welcome! Dance Party 7:30 - 9:30pm. No alcohol or smoking is permitted on the premises. A Fiendly group dancing for enjoyment. Ballroom dancing & lessons (waltz, rumba, tango & more). Our 18th year; always free. in the ROTC building on the Johns Hopkins University campus in Baltimore. No partner needed - we encourage changing partners; variety is very instructive. Dress comfortably. Everyone is welcome! It’s a great floor and all sorts of dancers. 17801 Meetinghouse Rd; same format, always free. Sandy Spring is 14 mi. west of rte 29 (near 29's north end) on route 108. 4 week progressive beginner series class at 7:45pm. Drop in intermediate class at 8:30. Dancing 9pm til midnight with DJ Dave Moldover. USA Dance is organized and operates exclusively for charitable and educational purposes and is approved by the Internal Revenue Service as a Section 501©(3) nonprofit organization. -- a fairly even mix of West Coast Swing, Hustle, East Coast Swing, Nightclub 2 Step, Waltz, Foxtrot, Country 2 Step, a few other genres, and requests from the crowd! --- We rotate the Leads and Follows no need to bring a partner in class. --- Great lessons, energetic music, and very friendly people! Variety of Music so everyone can enjoy the dance social, from Swing to Salsa from Tango to Waltz. All levels are welcome from complete novice to those who have been dancing a while. All of our instructors are present to talk to dance with & ask questions. It is a great opportunity to meet instructors, other people who enjoy dancing & get to know more about our studio. Free parking in Studio Lot. Join us for a Waltz Dance in the Spanish Ballroom at Glen Echo Park, MD on Sunday, June 12, 2011 and will feature the ensemble Back Roads Band. This versatile band will provide a lively mix of waltzes with a country & western flair, and a few other couple dances, including Texas 2-step, polka, and swing. The 45-minute dance lesson begins at 2:45 pm with a half-hour introductory Waltz workshop and a more advanced move presented the last 15 minutes. Social dancing follows until 6 pm. Admission is $10. No partner required. For more information, call Joan Koury at 202-238-0230 or Glen Echo Park at 301-634-2222, go to www.WaltzTimeDances.org or e-mail info@WaltzTimeDances.org. The Glen Echo National Park is located at 7300 MacArthur Blvd., Glen Echo, MD 20812. Join us for an enchanting afternoon of dancing, music, refreshments, entertainment, and fun! Meet fellow dancers and friends, learn new dances, and enjoy your afternoon dancing to a wonderful variety of ballroom and Latin music! The Tea Dance begins with a group lesson! Beginner dance lesson 1:00pm to 1:15pm. Dance Studio Lioudmila is a professional ballroom dance studio for the competitive and social ballroom and Latin dancer. Top instruction, fun classes, wonderful parties! We are conviently located just outside Old Town Alexandria near the the King Street Metro! Off-street parking behind the building. free snacks and sangria all night! Kizoukchata Nights presents a weekly Saturday evening social featuring Zouk and Kizomba dances with a Bachata chaser. We are now offering expanded dance lessons prior to the social! From 7:00 - 8:00 pm there will be an open-level Kizomba lesson, followed by an open-level Zouk lesson from 8:00 - 9:00 pm. The DJ dance runs from 9:00 pm until midnight and will feature a variety of music. No partner or prior experience needed. Zouk is a Brazilian dance derived from Lambada. Kizomba originated in Angola and grew out of Compas dancing, a Caribbean merengue style. Both styles feature sensual rhythms, close connection and subtle communication between partners, and are great for beginning dancers. Classes held during the week. Ballroom dancing, open to the public, are held every Saturday evening except the Saturday between Christmas and New Years. We have a 2550 square foot floating wooden floor. All dance rhythms are played. Popcorn, pretzels and soda served. BYOB allowed. Check our website for special events and theme parties. Do you love to dance? Then join us every 1st - 4th Saturday for social dance parties! Our sprung hardwood floor is waiting for you- let the music draw you in then stay for the company, snacks, and dancing. Ample free parking, conveniently located in Bailey's Crossroads area. Dance the night away in our spacious studio and meet other dancers from the DC/MD/VA area. All ages welcome, no partner or dance experience required. From 9 PM to 12:30 AM on most Saturday nights, Hollywood Ballroom in Silver Spring hosts a social ballroom dance. We are just outside the Beltway off Route 29, Colesville Road. We're open for social dancing 4 nights a week: Fridays, Saturdays, Sundays, and Wednesdays. Dance lesson 7:30pm to 8:15pm. No dance partner or membership required! Concession available for Sodas and Snacks. $12, includes lesson. Instructors available to help out. Beginners welcome! at Colvin Run Dance Hall, 10201 Colvin Run Rd, Great Falls, VA 22066. 8-9:00 pm dance lesson followed by dancing to live band music from 9-11:30 pm. Lesson and Band vary from month to month. $20 (cash or check only) includes lesson, dance and snack bar. Dress is ballroom casual. No partner, experience or reservation required. 1,850 sq. ft. oak dance floor! Friendly dancers and a warm, welcoming atmosphere. Woodmont and on Cheltenham across from Midas Muffler. at the Evangelical Reformed Chapel, 10 West Church Street. Lesson before each dance plus snacks and beverages. All levels, singles and couples are welcome. $10 Admission includes lesson; $7.50 for USA Dance members & Students (18+) with I.D. On A Quest For Salsa Y Bachata Dancing Mermaids! Join us every 1st and 3rd Saturday for our Ballroom/Latin social dance parties! DJs Kat Kinnunen and Fabio Bonini provide great music, while our hosts and hostesses keep the refreshments stocked and our guests dancing. Glide over a spacious, sprung hardwood floor with students, staff, and guests. We offer social dance classes before every party, so even if you have never danced before, you will be moving and having fun before you know it! Hope to see you there! Ballroom dancing, includes Swing, Waltz, Foxtrot, Cha Cha, Rumba, Tango and many more. Also some line dancing. 7:30-10:30; Guest fee is $25 per couple. people that attend, the more fun it will be!! Across the street from Berryville Grille and next to Re-Love It. $3 DISCOUNT IF YOU RSVP AT MR. MAMBO’S SALSA BACHATA MEETUP!!! MAIN BALLROOM MUSIC FORMAT 50/50 SALSA Y BACHATA ALL NIGHT! Every 2nd & 4th Saturday is "La Divina" Milonga with Live Music at Forever Dancing Ballroom! Come dance the night away on our sprung hardwood floor and experience the beauty and passion of Argentine Tango. DJ and Musicians will be playing Traditional Tango, Tango Waltz, Milongas and Tango Nuevo- the very best tunes. You won't want to miss this unique opportunity to dance to live, authentic Tango music. Refreshments, Fruits and Cheese available throughout the evening. music, from new to old, provided through the studio's sound system. Contact: Schain at 301-424-0007 or nowandthendancestudios@yahoo.com. Time: 8 - 9 PM, beginner group lesson. 9 -11, open dancing. Cost: $10 cash at door. MEN have half-price entry! Location: Now and Then Dance Studio, 10111 Darnestown Rd., Rockville, MD 20850. PH: 301-424-0007 . Plenty of on-site parking in the front and back. 5-6pm Salsa ON2 lesson by Irene Holtzman. 8:30 – midnight Social Dance Party Everyone is welcome! 10pm-3am Milonga DJ Ramu Pyreddy. Fresh fruit & water will be provided. Feel free to BYOSnacks. Milonga $12/$8 students. Class & milonga $20/$15 students. Come learn, dance, and join the fun-- Ballroom style! Take an evening break and join us for some beautiful music and classic dances by DJ Salsa and Ballroom Instructor Kat Kinnunen. Meet and connect with other ballroom dancers from around town as you dance the night away on our spacious, sprung hardwood floor. Ample free parking right outside the studio. Refreshments and snacks will be available throughout the evening. Locations and Instructors to be announcedm ck website. Asbury United Methodist Church Fellowship Hall or Wicomico County Civic Center in Salisbury, MD. Singles welcome; All levels of dancers welcome. Analia Centurion is guest instructor tonight! Inspiring traditional music tandas as played in the finest milongas of Buenos Aires. Featured is Hitomi's famous munchies table that includes fresh fruit & veggies, chocolate, cheese, chips & dips and hot & cold beverages! Volunteer one hour (set-up, clean-up or door) for free admission! Metro: Brookland–CUA on the Red Line at Monroe & 8th St near Michigan Ave, two minute walk to the milonga! Join us for an evening of Tango dancing with great music, refreshments and Tango Fanatics. Mr Mambo & SOS International Night Every 4th Saturday at DC Dance Collective. With classes, 2 floors of Latin music and pizza! Let's Go Crazy Social With 2 Floors of Fun. It's our international night - One top floor with Salsa, Mambo, Cha Cha..
And downstairs, the International Floor with Salsa, Merengue, Bachata, Latin House, Reggaeton, Hip Hop and more! - Dance classes with Go Go Earl @ no extra charge! - Snacks & beverages and late night Pizza! At the DC Dance Collective. 4908 Wisconsin Ave NW, DC. A 5-minute walk from Friendship Heights and Tenleytown Metro. 110 Union St. in Salem, Virginia. 5:00-6:30 Ballroom dancing to recorded music. We are starting the Saturday dances back up again!!! We play a wide variety of music, so you can dance all the different styles of Ballroom Dance! They take place every 2nd and 4th Saturday at the Rockville studio only! There's a beginner's (Bronze 1) Group Class at 8pm, and the Party will be from 9-10:30pm. The dances taught during the group class will be the same as the previous night's Bronze 1 Group Class. However, unlike those, the Saturday group class and dances are open to the general public as well as students. The cost is $15 per person. Feel free to spread the word since the more people that attend, the more fun it will be!! 10:30 – 12:00pm, $10 pp. An experienced instructor supervises and provides feedback on your dancing. Starting this September 10th, join Dance Bethesda every Sunday for the dance fitness crazy created by "Dancing with the Stars" Three Time World Champion Louis Van Amstel. workout on the dance floor! This class is designed for all skill levels. Paul and Debra are happy to assist all dancers with problems or questions–just ask! (You don’t have to be one of their students). Where Every Sunday Night is a Party in the Reston Town Center! Enjoy the Best Location to Meet Fun Singles, Finally Learn The Most Social Latin Club Dance Around, Enjoy a Fun Dance Date Night Out With Your Sweetheart, Or Just Enjoy a Fun Night Out Dancing in the Reston Town Center. From 8 PM to 11:30 PM every Sunday night, Hollywood Ballroom in Silver Spring hosts a social ballroom dance. We are just outside the Beltway off Route 29, Colesville Road. with California Mix Music that has almost everything on it! Line Dance runs concurrently in a second studio. 1st Sunday Blues Jam with The DC Blues Society. Musicians of all levels are welcome. Bring family, friends, and your dancin' shoes for a fun filled afternoon and evening. Cissel-Saxon American Legion Post 41, 905 Sligo Avenue, Silver Spring, MD 20910. Entrance on Fenton St near free public parking garage. Affordable Cash Bar - Outside Food Permitted. Salsa Dura! Guanguanco! Cha-cha Mambo! Timba! Neat casual dress. Appropriate footwear requested. April's 1st Sunday Dance will be 4-6pm at the Center for the Arts in Old Town Manassas. Join us for a Waltz Dance in the Spanish Ballroom at Glen Echo Park, MD will feature a Band playing waltzes and a few other couple dances. Hosted by The Winfield VFD Ladies Aux. 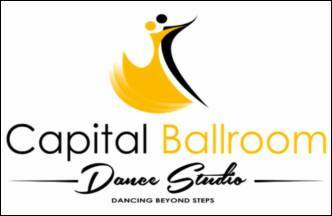 Come dance to beautiful music every 2nd and 4th Sunday evenings, from 730 pm to 10 pm, at Capital Ballroom Dance Studio in Bethesda, MD. Standard ballroom practice party is hosted by Hamid Taba. Parking is Free Saturday & Sunday in the County Garages on Woodmont and on Cheltenham across from Midas Muffler. The dancing area is smoke free. making your evening of listening and dancing in this cozy night club setting most enjoyable. Non dancers are invited to enjoy favorite refreshments while listening to the band perform music made famous by Stan Kenton, Glenn Miller, the Elgart brothers and other big band legends. 873 Grace St, Herndon, Virginia 20170 two Sundays each month since March 2014! Come celebrate our anniversary! We meet in the lovely Ballrooms A&B with our talented instructor Tim Bowker and his partner Laura Martin, concentrating on West Coast Swing classes (basic knowledge recommended) from 5:00 PM until 6:00 PM and *WCS crossovers, Latin, Hustle and Ballroom Social Dancing* following from 6:00 until 8:00 PM. Singles & Couples over 18 are welcome! Please Like Us on Facebook!